While Motherwell prepared for Saturday's game at Parkhead in the January wind and rain, our hosts were taking advantage of the bizarre SPFL opt out (for the second time this season) to rest their first team squad in Turkey. It's an ill-divided world. 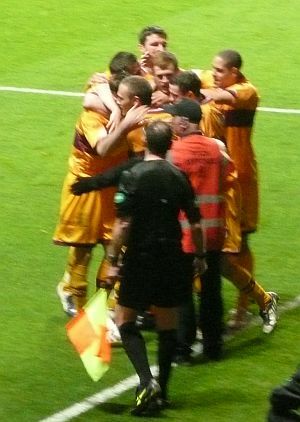 Yet while our opponents were on their winter holidays we extended our winning run to six with a victory at Tynecastle. If momentum and confidence mean anything in football then we should travel to Celtic Park without fear. Our record there is woeful but, to steal the much quoted financial warning, past performance is no guarantee of future results. The capture of Anier and Ainsworth has given Motherwell some stability as the meaty end of the season looms but despite the small squad at Fir Park there is no guarantee that the pair will start. McFadden was preferred to the Estonian last weekend and the manager will have some thinking to do before he selects the starting eleven. We can expect the familiar defensive line up but we'll have to wait until the team lines are released before kick off to know McCall's plans. Our opponents have racked up some impressive statistics in the SPFL and they last conceded a goal eight games ago. However, we might find some comfort by noting that they have scored only once in each of their last three outings. Most of the travelling fans would be delighted just to see their team score - that last happened in April 2010 when Reynolds gave us the lead in a 2-1 loss. Our 4 and 5 goal sprees against Partick Thistle and St Johnstone may suggest that a goal is possible but it would seem rash to predict anything but a 2-1 defeat. Update: We learn that Ramsden had a small procedure to his knee and he'll miss the next two games. It's likely that Kerr will fill the gap. Remember our last visit to Parkhead?